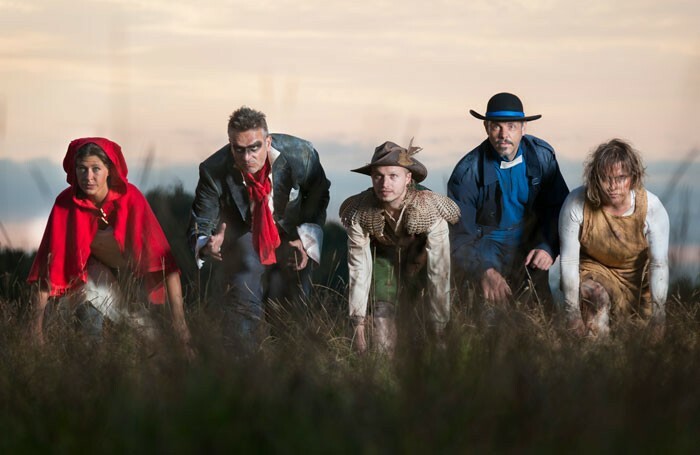 Red Riding Hood wears matching red trainers in this promenade theatre adventure based on the wolf stories from Angela Carter’s The Bloody Chamber. The audience elect to be either walkers or runners, determining both the route and the pace they take through the piece. The walkers must find the bride who has disappeared on her wedding day. The runners must hunt the wolves thought to have snatched her. The star of the show is Stanmer Park itself, with its ancient village and church encircled by thick woods. Striding out across its windswept hillsides as the light dims feels magical and eerie – and that’s before you spot the red cape disappearing into the trees. Burn the Curtain specialise in activity-based theatre, having had a previous Brighton Festival success with The Adventures of Don Quixote by Bicycle. So the atmosphere of The Company of Wolves is a strange combination of fairytale gothic and get-up-and-go. As we spot a fragment of bloody wedding dress here or a feral girl howling on a tree stump there, we are flanked by guides in cagoules and headtorches. Bringing up the rear is a cheery bloke in shorts shouldering a sound-system. At one point the Duke, suspiciously dark of eye and tattered of coat-tail, tears past, crying: “We are like winter winds trapped in a box!” The piece could use more of this dark poetry to flavour the longer walks between interactive scenes. But by combining two different ways of getting the blood pumping, Burn the Curtain have created a new and accessible theatrical experience.